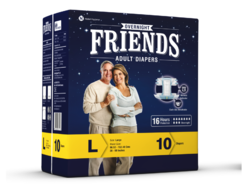 We are a leading Manufacturer of friends adult diapers pants, friends adult diaper, disposable adult diaper, friends premium adult diapers, friends adult diapers (institutional packs) and friends adult diaper - overnight from Nashik, India. Friends Adult Diapers has made a mark as a quality brand and enjoys a high customer loyalty by offering range of unique features. Millions of senior citizens have embraced an active lifestyle with dignity after using Friends. Doctors recommend adult diapers for patients with prostate disorders, piles, incontinence, urology problems, and diabetics. It is also used by patients who are paralyzed, bedridden or disabled. Wetness indicator which helps in making an informed decision about a diaper change. 10 Hours of protection and super absorbency helps in getting a great night's sleep. Dual Core Super Absorbent Pad. Brief like leg opening. Suitable for active men and women. 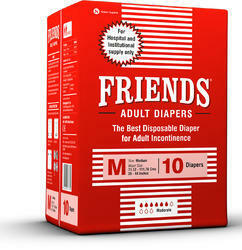 Friends Disposable Adult Diaper has made a mark as a quality brand and enjoys a high customer loyalty by offering range of unique features. Millions of senior citizens have embraced an active lifestyle with dignity after using Friends. Doctors recommend adult diapers for patients with prostate disorders, piles, incontinence, urology problems, and diabetics. It is also used by patients who are paralyzed, bedridden or disabled. Large to suit different body sizes. They are available in packs of 10. 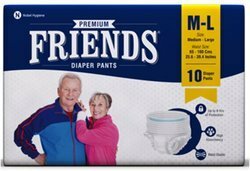 Friends Adult Diaper has made a mark as a quality brand and enjoys a high customer loyalty by offering range of unique features. Millions of senior citizens have embraced an active lifestyle with dignity after using Friends. 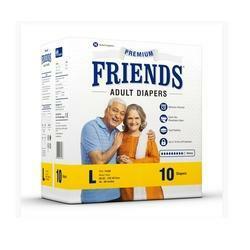 Doctors recommend adult diapers for patients with prostate disorders, piles, incontinence, urology problems, and diabetics. It is also used by patients who are paralyzed, bedridden or disabled. 16 Hours of protection and super absorbency help you in getting a great night's sleep. 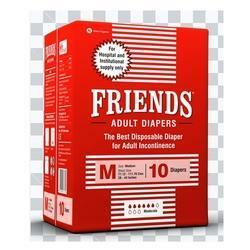 Friends Adult Pull ups Diapers are easy to pull up and down like regular underwear. Pull-Ups feature stretch waistband and tear-away sides for easy removal. It provides a snug fit and looks like regular underwear. Blue elastics on the waistband indicate the front of the underwear. With an ABSORB-LOCK core and worry-free odour control. The world class quality pant style diapers for Adult which has Brief-like leg openings help protect against leakage and provide snug comfort like an underwear. 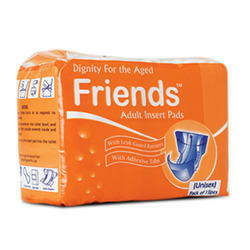 Friends Adult Insert Pads or Incontingence Pads are for light urinary incontinence protection. The super absorbent core material locks fluid & odor away from your body for drier skin and freedom from embarrassment. An adhesive strip holds the urine pad in place for a secure fit in underwear. They are available in packs of 10's.